This is a Halal version of Tiramsu recipe. 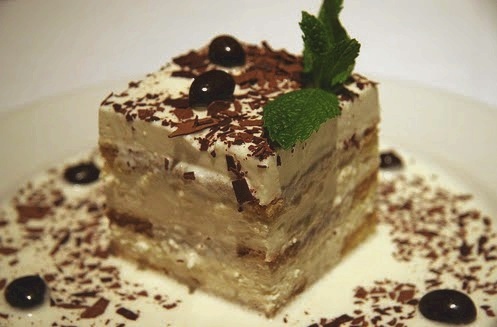 Tiramisu literally means "pick me up". Many Italian regions claim to have invented it. So a wide variety of recipes exist for this dessert. Since this one contains no alcohol, it is particularly appropriate for kids. Pour the coffee and the milk into a small dish, then lightly dip the biscuits. Place them in the individual small serving bowls or cups (about 250 ml). Cover the biscuits with the cream. Sprinkle the cocoa powder on top. Refrigerate for at least one hour. Leave overnight in the refrigerator for best results. (Tiramisu keeps up to 3 days in the refrigerator). Serve cold. Tip: To make the chocolate curls, use a vegetable peeler and run it down the edge of the chocolate bar. Recipe #2 (Non-Halal) Contains :Kahlua" Mexican coffee-flavored liqueur. This video is just to get you the idea on how Tiramisu is made. That a great idea. "Halal Version of Tiramisu for Children!" isnt not only for children, but adult who doesn’t take alcohol, especially moslem community.